Together with Halong Bay, North Vietnam tours also offer a boat tour in Trang An Vietnam – the place of special geological characteristics and historical sites from the early time of Vietnam. Going through hundreds of years under the effects of nature, limestone mountains and caves having various shapes of stalactite inside have become the main scene of this area. Covering these limestone mountains are tropical forests with the diversity of flora and fauna, which brings fresh air and breathtaking landscape for Trang An. However, things that make this location become mysterious is wallets under mountains and the fact that all the caves are connected by lakes, streams, and rivers. Therefore, your excursion to Trang An using boat will give you a chance to fully make the most of this destination. To help you with your trip, here we put together some useful information. From January to March, like many areas of North Vietnam, the weather of this zone is very mild at this time. Besides, the festival in Bai Dinh Pagoda- the tourist site belonging to Trang An Scenic Landscape Complex, will take place at this period. As a result, you can pay a visit to Bai Dinh Pagoda when taking a Trang An tour. However, notice that during this course of time, Trang An is in high season; the destination will be thronged with crowds of tourists. Another alternative for you is late May or early June. The weather at this stage may be quite hot but the redeeming factor is that the area will be less crowded. 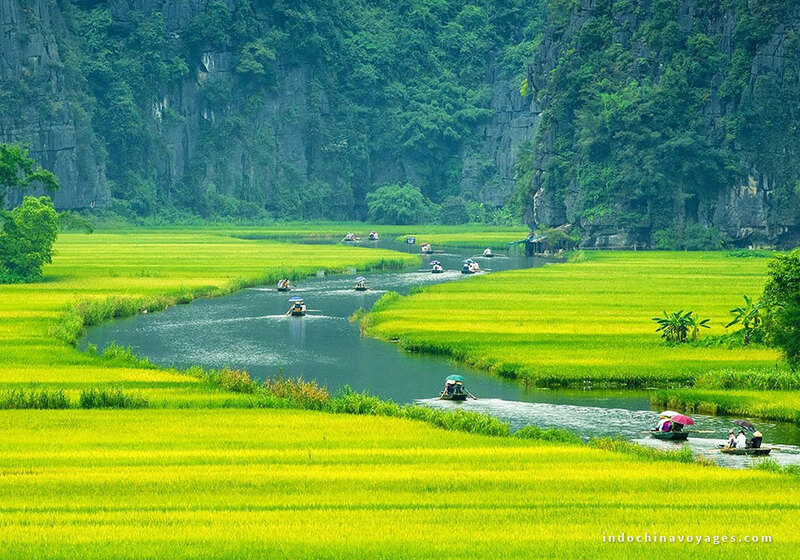 Moreover, coming to the site these days, you will be impressed by the golden rice paddies of local residents surrounding Trang An while floating in a boat exploring the beauty of Mother Nature. Giap Bat station and My Dinh station are the two ones where you can buy a ticket to go to Trang An by coach with around VND100,000 (approx. US$4.4). It’s recommended that you should leave at 4 or 5 am to get to your destination at 7 o’clock. If you have lots of luggage and care about safety, the train is the most suitable for you. Traveling by train is also a good chance for you to sense the beautiful landscape of the two sides of the road. The price for a slot varies depending on its quality. From the central Hanoi, you can follow the routine of Phap Van highway – Gie Bridge – Ninh Binh. It will cost you about an hour to reach the center of the province. For ones who fancy backpacking, this means of transportation is so familiar. 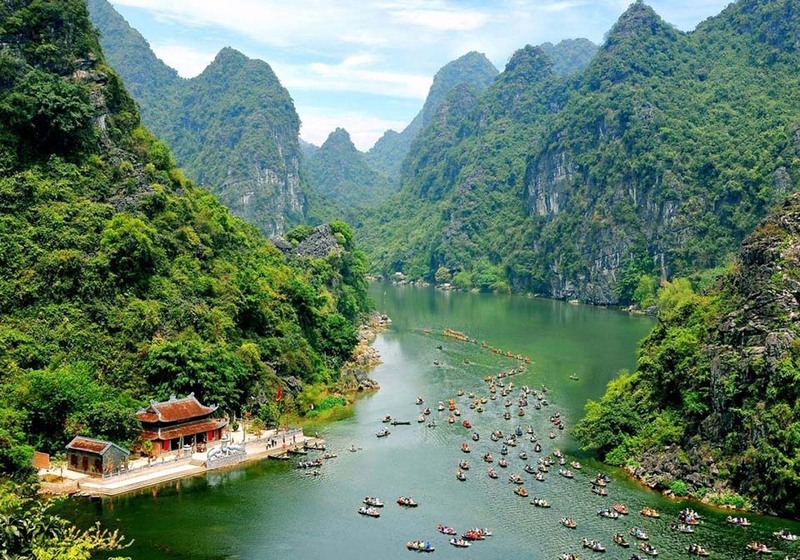 Following the old National Highway 1A, turning into the direction of Ninh Binh – Thanh Hoa are the things you have to do. In case of using coach and train, you can get to Trang An from central Ninh Binh by taxi or motorbike taxi. 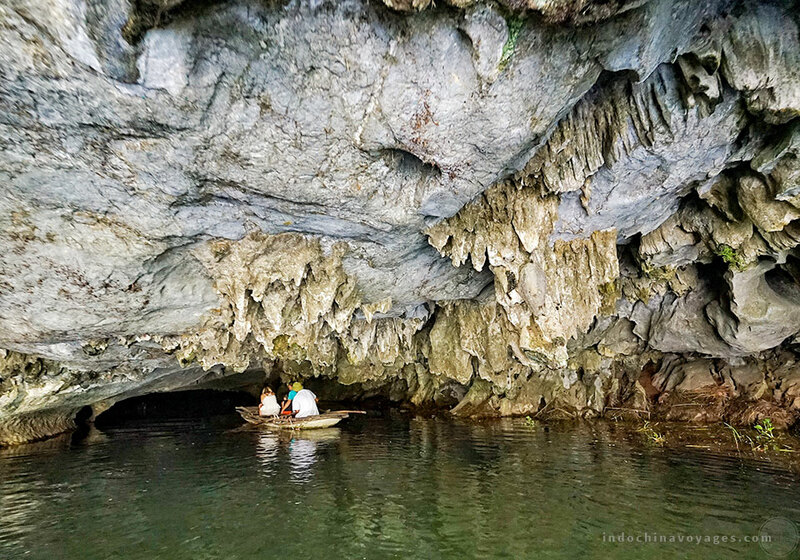 Since all the Trang An caves are connected with each other by rivers, lakes, streams, boats are the main means of transportation for you to explore the inside of Trang An. The fee for entering Trang An including the cost for a Trang An boat tour is VND200,000 (approx. US$8.8) for an adult and VND100,000 (approx. US$4.4) for a child under 1.4m. Trinh temple – Toi Cave – Sang Cave – Nau Ruou Cave – Tran Temple – Ba Giot Temple – Seo Cave – Son Duong Cave – Bao Hieu Pagoda – Khong Cave Tran Cave – Quy Hau Cave. Lam Cave – Vang Cave – Thanh Truot Cave – Suoi Tien Temple – Dai Cave – Vu Lam Palace – Kong’s film studio. Trinh Temple – May Cave – Tien Stream – Dia Linh Cave – Dai Cave – Vu Lam Palace – Kong’s film studio. For the first routine, it will take you 3.5 hours. The next two ones are 2.5 hours and 3 hours respectively. 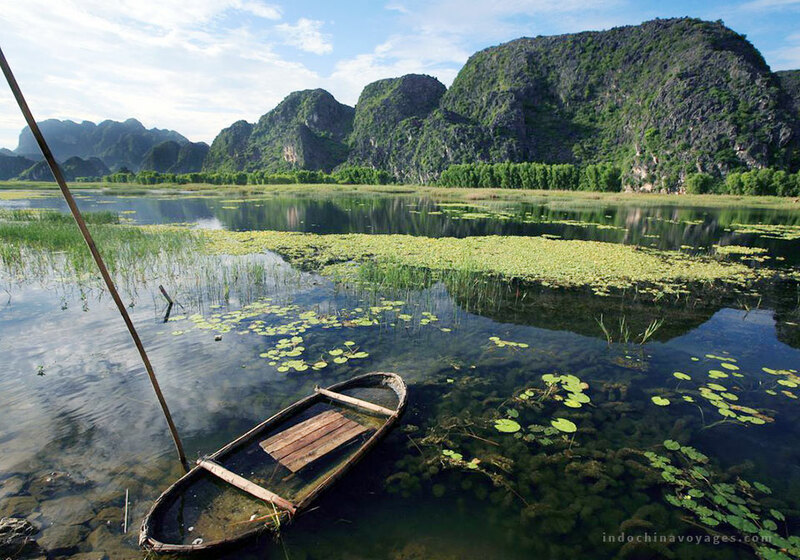 During the cruise around Trang An by boat, you will experience the feeling of floating on a boat gazing with veneration magnificent limestone mountains, caves and rivers around. Each cave has its own characteristics. While Toi Cave is dark all the time because of its length (315m), Sang Cave is always bright as its length is only 100m. Inside every cave, the stalactite with different shapes and colors is the thing that attracts visitors. Their names originate from their features or from mysterious legends, which you can hear from the locals. Along the journey, travelers can visit historical sites of the Dinh Dynasty and the Tran Dynasty since Trang An used to be the capital of Vietnam under these two reigns. Bring a pair of sports shoes: As the most common land-form of Trang An is the mountain, a pair of sports shoes will be the best option when climbing. Choose suitable clothes: Your Trang An boat tour includes visiting some historical sites, therefore, wearing politely is recommended for foreigners coming to an Eastern country, especially Vietnam. Hire a life jacket: A boat cruise in North Vietnam tours will be much safer with a life jacket in case you don’t know how to swim. Bring a small umbrella: If you choose to travel during the period from January to March, drizzles are common to see. Bringing a small umbrella with help much with your trip. Book hotel in advance: like in every tourist attraction, the number of tourists coming to Trang An during high season is a lot, so booking in advance is the thing that you shouldn’t forget. 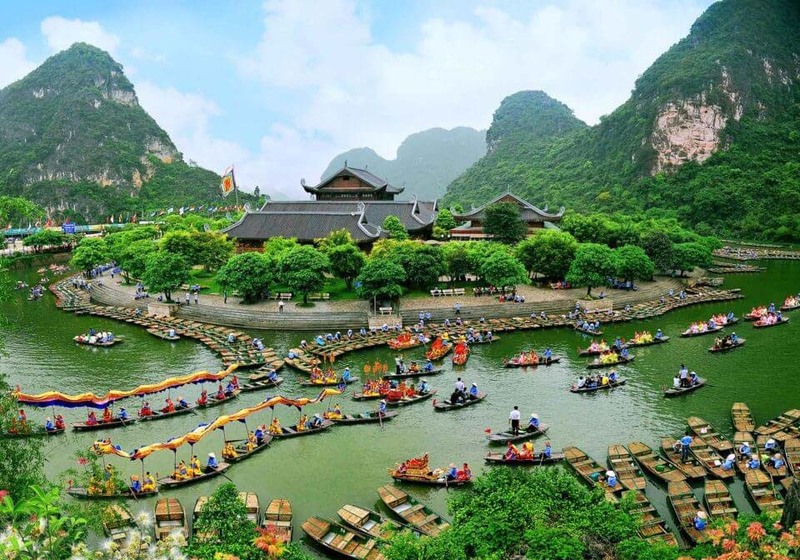 Besides, this Ninh Binh – Trang An Private Day tour will cover all expenses needed such as tour guide, private transfer, rowing boat ride, lunch, etc. Good luck with your trip to Trang An Vietnam!